My angel was beside me today and he heard me for sure. There’s this beautiful site I discovered a few years ago after prayer to find an online Adoration chapel. Since I live far away from a church and certainly no chapel close by for Adoration, my best recourse was an online adoration site. I visited a few but nothing caught my heart till I found the Divine Mercy Chapel in Poland that offers a 24-hour transmission. This famed chapel houses the original, miraculous painting of the Divine Mercy. From thousands of miles away, before it I’ve knelt countless times, in seeking and in rest, in calm and in tears, in times of anger and in times of fear. Each time, my prayers have been answered. A visit here became part of my daily morning prayers. I felt the difference on the days I didn’t stop by. But there was something more that I sought. I wanted a chapel close to my place of work. Early in my working life, I had worked at a place tucked away from the bustling street, situated practically on church grounds because that St. Francis Xavier church was a mere one-minute trot away. I was going through heartbreak at that time, and the little church, with its green and sedate pre-War cemetery beside it, was where I went to bury my tears. I guess I first learned about Adoration there – without actually knowing anything about it. Now, decades later, I sought this same stillness for my work hours. I sought a church-by-my-heart to escape the relentless, unending sprawler’s revelry that has taken over my office. I wanted the quiet hush of the presence of the True God, a place to get my breath back every time the tenets my colleagues adhere to choke the life out of me. After this rose the old wish for a chapel. It was then that the light fell upon me. To load and bookmark the live-streamed Divine Mercy Chapel site on my phone home screen. So every time life got too much, every time I felt myself veering towards prohibited roads, on this First Saturday of the Rosary Month, I finally have a chapel a mere touch away. O most holy angel of God, appointed by God to be my guardian, I give you thanks for all the benefits which you have ever bestowed on me in body and in soul. I praise and glorify you that you condescended to assist me with such patient fidelity, and to defend me against all the assaults of my enemies. 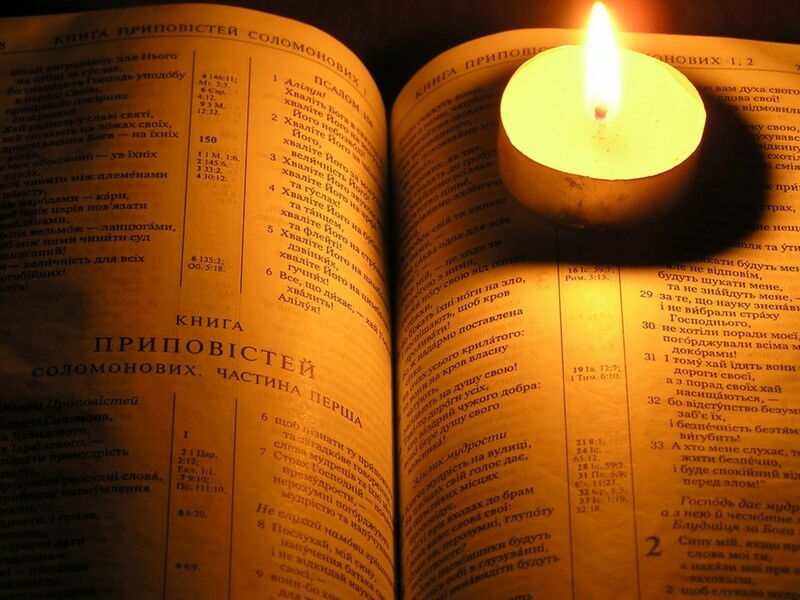 Blessed be the hour in which you were assigned me for my guardian, my defender and my patron. In acknowledgement and return for all your loving ministries to me, I offer you the infinitely precious and noble heart of Jesus, and firmly purpose to obey you henceforward, and most faithfully to serve my God. I offer you the infinitely precious and noble heart of Jesus. holy and pleasing unto Thee. My whole day, its joys and twists, I try to offer up to God for a specific need or I leave it to Him to use my day’s worth where it is needed. There was an event that I had to attend today and from more than 2 weeks back I had been agonizing over it. Even when I was not actively thinking about it, it was always at the back of my mind, like a stench from a secret rot. I certainly prayed a lot, asking God to help tell me what to do – but I prayed to escape the event – and aligned God along that very line too. I hatched any number of escape plans too. Except that none of them felt like it was – it. Yesterday, I sagged and gave up to His Will. Finally conceding defeat, I sourly offered up the coming difficulty as reparation. No saintly, joyful suffering for me. I dragged myself to the day. The hours of the day fell among gentle plains and soft winds. I had expected only needles and knives, everything that suffering is to me, whatever its form. But it was as if someone had gently come to glide me past hurdles and traps. Even the unpleasant ridges seemed to have had their edges worn down. …you condescended to assist me with such patient fidelity, and to defend me against all the assaults of my enemies. I understood then why the day I had dreaded for so long had seemed swathed in softness and gentleness. I saw why bridges had formed over breaches, why briars and brambles had been cleared from the path. Someone had laboured for me. My angel had come in my hour of need. I’ve lived a lifetime this week. Of worry, agitation, jittery hopes. A world where the winds changed course every hour. Of journeying through successive portals of hope, despair, jubilance. Every soul on this same journey traced similar routes of uncertainty as the angels fought for Freedom for us. Then, through a weave of unexpected twists and turns, guided by the Light of Prayer and Miracles, the sun finally broke through the clouds. And joy raised its gold swell in hearts. Suddenly, everyone had news and thoughts and analyses and jokes. In this massive cavalry of citizens long suppressed and oppressed, we were brothers and brothers shared everything. Every happening. Every video. Every thought, tale and snigger. We were brothers and brothers supported each other in everything. No one turned off their phones nor their tv’s. We gave ear and eye to every morsel that spoke of hope and freedom. Never mind that it took our rest, our sleep; no one turned their faces away from the other. When I finally went to bed in the wee hours, it was with jubilance and excitement at further developments in this newly won freedom. Yet, awakening scant hours later, it was the refrain, The sound of silence, that garlanded my hearing. But the hours I had risen to were those of deeper excitement, intrigue and giddy happiness. They were definitely not of stillness and silence. And so, I sailed on, buoyed by those rejoicing waves. The sound of silence played on undeterred. It was after one in the morning the next day that the angel held my face and turned it away from the noise till I gazed into his eyes. Seek silence, he wrote on my heart. 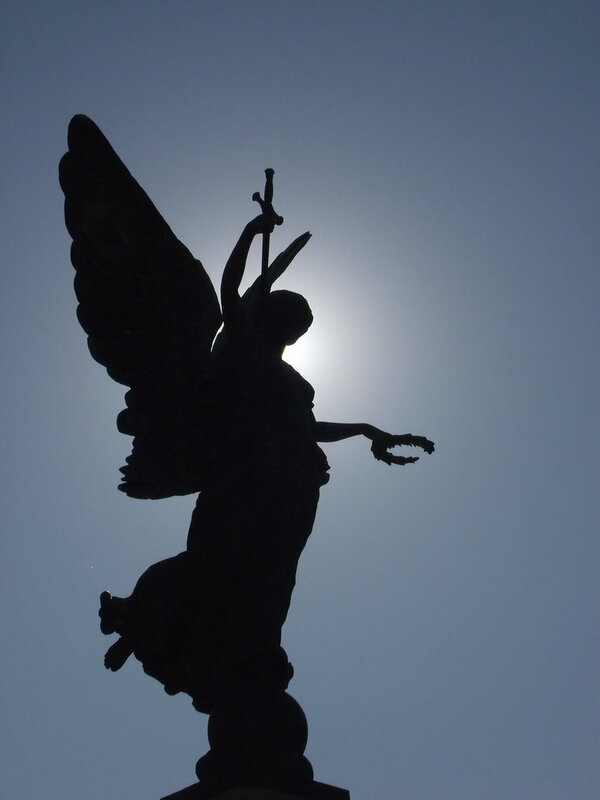 Since I read St. Gertrude’s Guardian Angel Prayer, I have become more conscious of my unseen companion. I went into the challenging hours of yesterday willing myself not to lose peace over discomforts, delays and sandpaper-moments. In every door I passed through, my heart sought that golden presence. Granted, I didn’t always choose the way of Light in the hundred moments embroidered into the busy day. But with each stumble, I righted myself and started anew, my spirit always in alertness for that fragrant peace that could still storms. My Angel was asking an offering of me. I did not refuse. Every time my heart saw the Angel, I whispered, I offer you the noble Heart of Jesus. I think my Angel of Peace has come. Since the events of yesterday, despite the crags and ruts the day held, no trouble ripples have touched my heart today. I went about my day in quiet and in unruffled peace. I believe that for every path that opened up before me in each task and decision of the day, the angel gently lit up the one that lay in the will of God. In uncharacteristic obedience, my spirit acquiesced each time. Because today, given my foot injury, I was not able to heat up the floors rushing from one task to another. I was forced to slow down, to walk with careful, measured steps. At this slow, labored pace, I had time to think and to sift through responses. I didn’t plunge headlong into tasks. When the photocopier got overheated, I didn’t rush to another bullet on my to-do list while it cooled down; I sat down and stared out at the distant hills wearing their trees like jewels. Despite the disruptions and machine breakdowns and the ungainly hobbling, everything that needed to be done got done and got done in peace. Because I left myself and held Another’s hand. Because today I followed the Angel’s Light. I grew up not really caring whether I had an angel or not. Being blessed with a streak of mischief, it was better to not have an angelic shadow nearby. 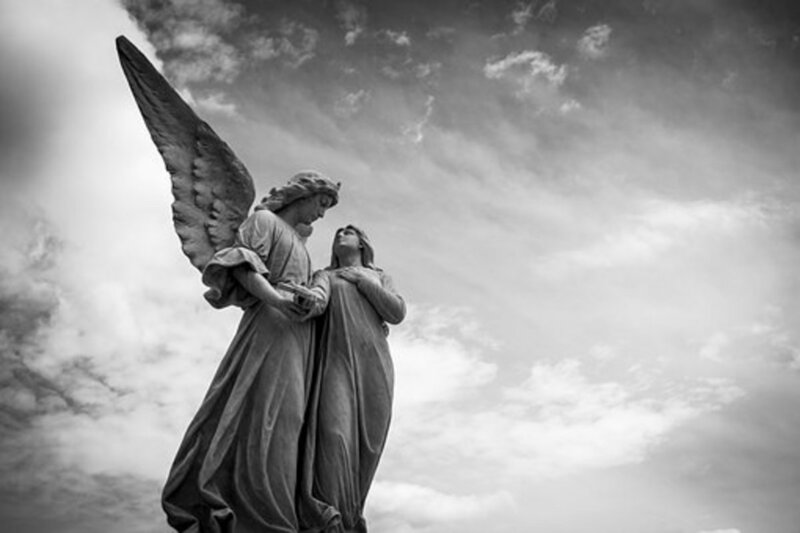 My first knowledge of angels came from an aunt bent on giving me the spiritual education that she felt my mother incapable of. So, from this well-meaning aunt, I learned that a girl gets an angel with pink wings and a boy gets an angel with blue wings. Four years of age, I thought it all very pretty but my relationship with angels still didn’t take off. Blue wings and pink wings weren’t enough for me. In my late teens, I had two experiences where I distinctly heard the voice of someone unseen. One time, I was awakened by a firm tap on my shoulder and a “Wake up!” when I had fallen asleep studying for college exams. The other time was when a roommate’s boyfriend decided to announce his arrival to visit his girlfriend, from three floors below, by throwing stones at the wooden window frames. It began with small ones aimed at the window where I sat studying. Absorbed in something, I ignored them. In a fit of temper, he followed through with a great big stone, but a split second before, I clearly heard a voice sharply command, Move!! The urgency of it lifted me out of my seat and flying right to the door across the room. How I did that I don’t know. And the next second that miserable rock flew through the open window where my head just was. Had I still been at the window, I might not be here now. For a long, long time after, I pondered those experiences. I assumed it was angel each time, but it didn’t sink deep enough into my cluttered heart to make me seek them out. In the ensuing years, I would go on to have a few more experiences. Each time, I learned anew that someone was looking out for me. But I never lingered on that comfort of insight because my life then, living with abusers, was totally about others; I didn’t even feel that I needed someone to watch over me. I was trained to not expect someone to look out for me, to care for me. It was ingrained into me that I didn’t deserve this care. Angels were just something on the walls I passed by each day. Then, one day, angels came back into my life, and revealed themselves slightly. In the weave of sun-tipped months that followed, I learned a joy I never knew, a purity of giving foreign to me. Angels taught me to love and to love freely. They softened my heart to receive and enjoy pure love too. All too soon, one night, they came to my door in a stream of light that could not be turned off. They gently passed a hand over a lively wick, and I learned a grief I never knew before. But even as they put out an earthly light, they lit a new heavenly lamp for me and left it in my heart to light the bitter dark. The angels never left me. Every time I fell, overcome by the cross of mourning, unseen hands lifted me to my feet, whispering, You must go on. There is work to be done. On the days when the grief got too much and I needed to stuff a cloth against my mouth to muffle the anguished screams, I felt a soft hand pressed against my heart to slow the tide of sorrow. Slowly, ever so slowly, through the haze of weeps, I began to learn about angels. The colour of their wings, or even if they had them – mattered not. There was so much more to them than I ever realized. And more than I will ever know. 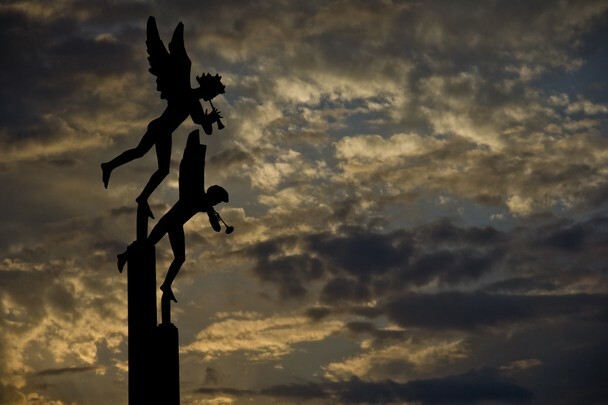 I believe the words written by the late Fr Gabriele Amorth – The glory of the angels, too, will be increased according to their good deeds; therefore, it is very useful to invoke their help. I know this for the truth it is. Every time I leaned against the angels and chose to love despite the wrenching sorrow, that new angel~lamp lit the night grief came to stay, burned brighter. 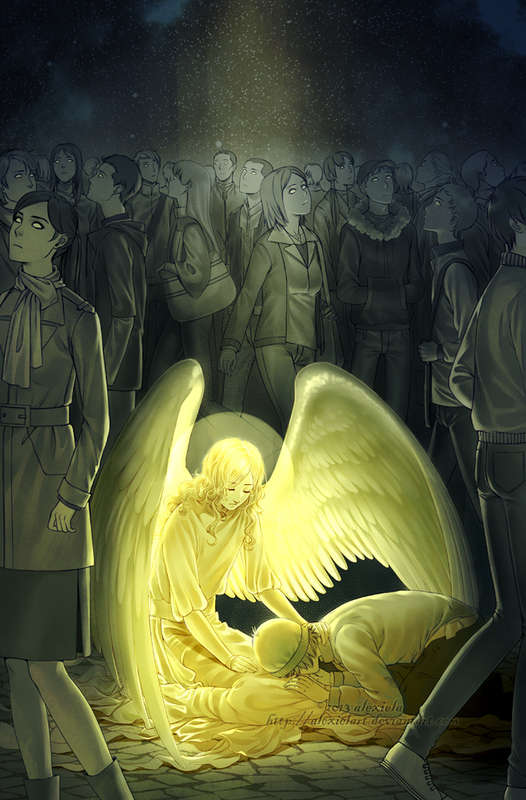 We need angels, whether we care to admit it or not. Some weeks ago, a nun told me to send out angels when I pray, for there is no heart not touched by storms. Every heart needs an angel. Thinking of the way angels have kept guard over me, someone must have prayed me angels too. And that prayer is now mine for others. Guiding to Wisdom never wrong. To the angel who heeds only the Master.